Singapore – Sep 10, 2018: Bomanbridge Media, a Singapore-based content distribution and production agency is excited to announce the global launch of a new factual adventure series with extreme British adventurer, Ash Dykes. Partnering with production house Mandarin Film, Into The Heart Of China: Walking The Yangtze will witness the potential first world record breaking event with Ash walking the length of Asia’s longest river, the Yangtze over a period of one year. Ash is a two-time world’s first record holder; having completed a solo and unsupported walk across Mongolia in 2014 and in 2016, he then became the first person ever to walk the length of Madagascar. He is a man who sets his limits beyond what most would see impossible, and now he is ready to take on his biggest mission ever, #MissionYangtze. Spanning a total distance of at least 6,380km, Ash will walk the entire length of the Yangtze river by foot. The 6 x 30’ epic expedition will document Ash’s most ambitious record-attempt to date as he overcomes the extreme temperatures, harsh conditions and treacherous terrain throughout his journey. Ash will start his journey from the Yangtze’s source in the melt waters of the Jianggendiru Glacier on the Tibetan Plateau to its delta near Shanghai, where it meets the East China Sea. Apart from covering challenging terrains, Ash will meet with some of the 400 million people who live along the Yangtze river and who depend on it for their way of life. He will experience first hand the fast development of China as he breaks from rural to urban civilization. Filming began in late summer 2018 and is expected to be delivered in Q4 2019. Bomanbridge, handling global distribution for this project, will be bringing Into The Heart Of China: Walking The Yangtze to MIPCOM for key broadcaster and pre-sale conversations. “Bomanbridge is tremendously excited about this new project Into The Heart of China: Walking The Yangtze, as we feel it is an authentic adventure which crosses all cultural lines. The global appeal is obvious. We are currently looking for further key co-production partners to share with us in this world record breaking riveting editorial and that rare chance to be part of an “historical first”. Our production partner, Mandarin Film are putting a lot of creative work into the filming of this complex project. Access to the Chinese landscape is always tricky and having partners like Mandarin Films is fantastic.” said Sonia Fleck, CEO of Bomanbridge Media. “We believe that this adventure is one of history’s few last great adventures yet to be taken on. Ash has risen to the challenge, learning Chinese, preparing physically and mentally and undergoing technical training looking to take us with him every step of the way for the times when we don’t have a camera crew with him. We plan to make this project one of the most multi-media and interactive expeditions ever, appealing to a Chinese and International audience alike. Following in the footsteps of great modern explorers like Leveson Wood and Ed Stafford, Ash Dykes is at the forefront of the new younger generation of adventurers making their mark on world firsts. China is a beautiful, varied and friendly place with surprises around every bend and new cultures and traditions in every region. We look forward to you joining us for this journey Into the Heart of China!” said Patrick Carr, Executive Producer of the project and CEO of Mandarin Film. Explorer, Extreme Athlete, 2X World First Record Holder, (FHM:- “One Of The World’s Most Fearless Outdoors Men”). (Wales Online:- “7th coolest person in Wales”). Speaker, Muay Thai Fighter, Master Scuba Diver. Aged only 27, Ash has been invited to 10 Downing Street on two occasions after his feats, was shown social support by Bear Grylls, Sir Ranulph Fiennes, Duncan Bannatyne and won the 2015 UK Adventurer of the Year Award and the 2016 Welsh Adventurer of the Year Award. He was also featured on The Times, Forbes, The Guardian, Mail Online, BBC World News, ITV, Arise TV, Discovery Channel, Channel 5 etc. 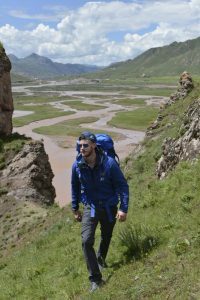 In 2014 – Ash became the first person ever to walk across Mongolia solo & unsupported, over the Altai Mountains, Gobi Desert & Mongolian Steppe, 1,500 miles in 78 days whilst pulling 120kg in a wheeled trailer carrying provisions needed to survive. In 2016 – Ash became the first person ever to traverse Madagascar’s length, through it’s interior taking on eight of the highest mountains on the fourth largest island in the world, 1,600 miles in 155 days. Tackling Desert, Savannah, Tropical dry forest Jungle, Mountains and facing many mishaps along the way. Mandarin Film has produced and co-produced a number of award-winning documentaries for an international audience. Founded in 2006, Mandarin Film has provided production services for corporate videos, documentary series and feature length docs, and multi-million dollar budget Hollywood movies. Of relevance to this project, Mandarin Film has been the China production team for Mighty Rivers with Jeremy Wade (River Monsters) for Discovery Channel, a travel show with Sue Perkins journeying the length of the Mekong River for the BBC, the Grand Tour China episode and a crazy adventure in a camper van across China for Channel 4.